Everyone wants fresh, clear and happy skin. Here are a few tips and tricks that I thought I’d share with you lovelies! 1. WATER – We all know this. But a reminder is always nice. Not only does it hydrate our bodies and help us feel refreshed, it also helps to flush out all of the impurities. Bottled water is super handy while you’re on the go and even in the house for easy access. Or, buy a cute mug or water bottle to fancy things up and help keep you on track! Stay hydrated! 2. Omega-3 Fats – Healthy fats are so important! They give us energy and make our skin soft. Not only are healthy fats good for your skin, they are also beneficial to your hair and nails! A few of my favorites are vitamin e and fish oil. You can easily get either of these in gel capsules at your local grocery store or health store. Coconut oil is also great! You can cook with it or put it in smoothies like I do! 3. Fruits & Vegetables – Eat up! They are so healthy for your skin and body. Fruits and vegetables will keep your skin glowing and clear. They are full of vitamins and nutrients that our bodies love and that will keep us looking and feeling our best! Here’s one of my favorite nutrient rich, delicious smoothies! The protein powder is optional although I prefer it because it keeps me fuller longer. Drink this to GLOW! Powerhouse Smoothie! Blend this baby up and voila! 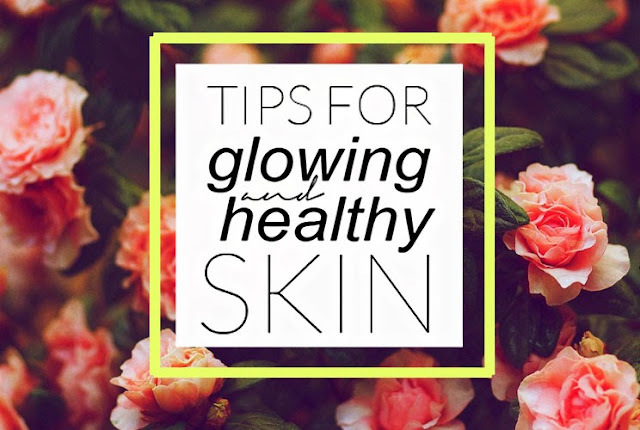 Cheers to healthy, beautiful skin!